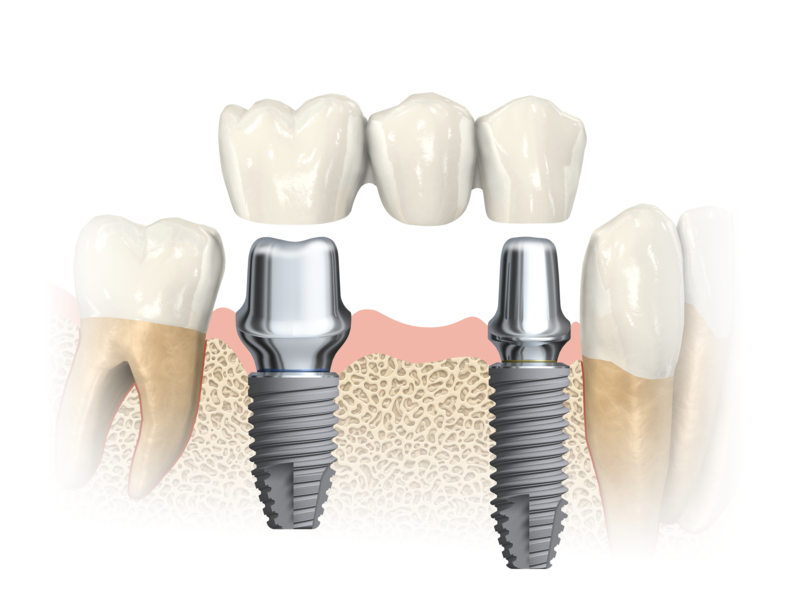 Dental implants are titanium screws that replace and function as the new root of a missing or extracted tooth. They form a foundation for which a crown or bridge can be attached, and can be used to stabilise and retain upper and lower dentures. Dental implants can be placed in either the upper or lower jaws. Due to the biocompatible properties of titanium, a dental implant fuses with the bone and becomes a good anchor for the replacement tooth. Dental implants can be used in solutions for replacing single or multiple missing teeth. 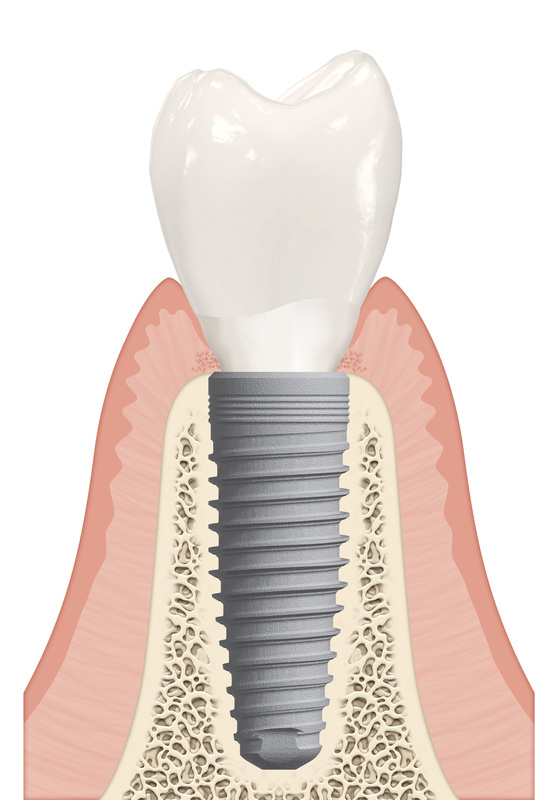 Implants enable the restoration of appearance and function of the jaws. Anyone who is missing one or more teeth due to injury, disease or tooth decay may be a candidate for dental implants. The determining factor is the amount of available bone. 1. Next best thing to healthy, natural teeth - a dental implant restores a tooth so that it looks, feels and functions like a natural tooth. Other options can lead to bone deterioration which can interfere with eating, smiling and speaking. 2. Long term solution - a dental implant is built to last. While dental implants may need periodic adjustments, they can last a lifetime when properly placed and cared for over time, as opposed to tooth supported bridges which can often only last 5-10 years. 3. Retain your natural face shape - when you have several missing teeth your face can appear to be sunken or sag. Dental implants can allow you to retain the natural shape of your face. 4. Keep your teeth in your mouth not in a cup - no more need for those dentures that slip and fall out and move around when you eat. 5. More predictable than other restoration methods - Dental implant treatment has a track record of reliable, long-term successful outcomes and is often considered “more predictable” than other treatments to repair or replace missing teeth, including bridgework, removable appliances and retreatment of failing root canal (endodontic) therapy. Dr Webber is a specialist in the field of implant placement and is one of the highest users of Nobel Biocare Implants in Queensland. Nobel Biocare are the world's leading dental implant manufacturer and have over 40 years of research behind their product. Dr Webber and his team provide exceptional service encompassing the entire field of implant surgery, with our fees being highly competitive for a Specialist Surgical Practice. An implant consultation with Dr Webber is approximately 30 minutes in duration. He will review your mouth clinically and radiologically. 3D Cone Beam Scans may be required to determine your bone volume. For your convenience we have a 3D scanner in our consultation rooms located at Gold Coast. During your appointment, Dr Webber and his team will appropriately and efficiently coordinate the safest, most predictable cost-effective treatment plan. Throughout the entire process, Dr Webber will liaise and work closely with your General Dentist or Specialist Restorative Dentist to create a treatment plan that will provide you with the highest quality aesthetic and functional result. Please click here for post-operative instructions.